Local Indigenous artists and production trainees creating collectible items are benefiting from a government-funded skills training and work experience project. 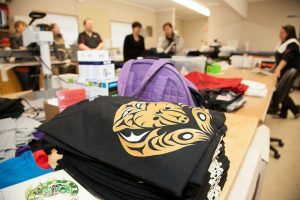 Through this project, Stó:lō Nation is training participants in computer-aided light manufacturing, such as laser etching, embroidery, heat transferring and printing, and helping them develop skills in warehousing operations, while supporting artists in sharing their designs on products. Mable Elmore, Parliamentary Secretary for Poverty Reduction, toured of the facilities and attended an artist open house at the new Stó:lō Interpretive Centre today. Through Nations Creations, a social enterprise created by the Stó:lō Nation, eight participants are receiving training in producing a wide range of gift items, including prints, bags, bookmarks, glassware, jewelry and clothing, which features artwork by local artists. They are also gaining warehousing experience by filling orders and shipping products to stores across Western Canada, and furthering their learning through on-the-job experience with White Feather Manufacturing and Monaque Native Crafts. A second group of up to 12 people will begin training in August. Artists who work with Nations Creations are paid a royalty for each item sold with their design, rather than a flat fee. This provides a more sustainable income over time for the artists. The Ministry of Social Development and Poverty Reduction has committed $606,000 in funding for this project through the Job Creation Partnerships stream of the Community and Employer Partnerships (CEP) program. CEP funds projects that increase employability levels and share labour market information.